Dutch Oven Cinnamon Roll! Be the hit at your next campout when you make this giant cinnamon roll for a delicious breakfast or dessert! 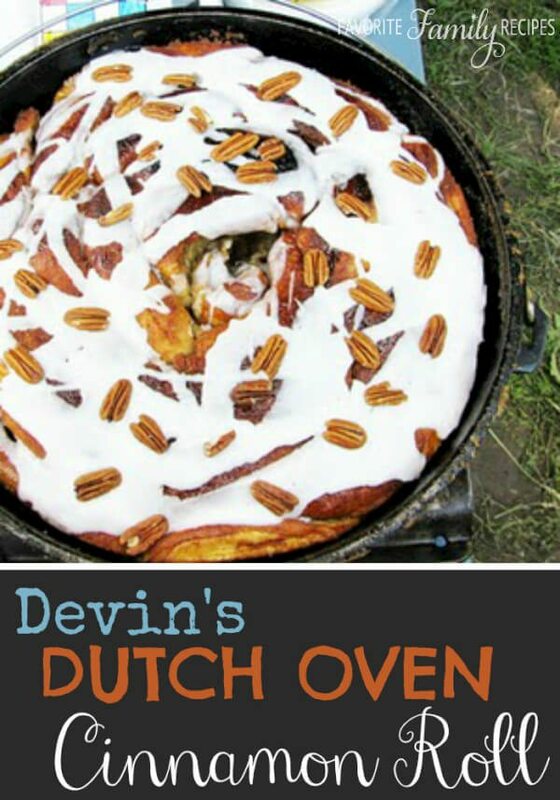 Guest Post by our brother, Devin: *Dutch Oven Cinnamon Roll pictured was made from this recipe tripled. I have been looking for a new dutch oven dessert for a long time now, the cobblers have become boring so in my spare time I have been thinking… obsessing about just what I can do to make Dutch oven desserts fun again. Then one night I had a dream… No a vision!!! No…. let’s call it divine inspiration. Behold, here is my new creation… a dutch oven cinnamon roll! *Dutch Oven Cinnamon Roll pictured was made from this recipe tripled. Cut each loaf of Bread dough into 4 pieces. Form each piece into a rope about 18” long. Brush each rope on all sides with melted butter. Stir together sugar, brown sugar, and cinnamon. Place mixture on aluminum foil. Roll rope in sugar mixture. Shape rope into a coil in the center of a 10” Dutch oven. Repeat with the next rope and continue the coil in the Dutch oven. When finished sprinkle the remaining sugar mixture and chopped pecans over the coil. Cover it and let rise 30-40 minutes. Bake in the oven at 350 degrees, or with top and bottom charcoal heat, for 30 minutes or until done. Stir ingredients together. If the glaze is too thick add milk a little at a time until it reaches the desired thickness.After the Cinnamon Pecan Ring is finished baking, cool it about 15 minutes then spoon the glaze over it. Decorate with pecans. NICE!!!! I am so happy that you posted!!!! This looks divine! Thanks Dev! Great recipe!! What size DO was that? A 14″? Yeah Dev, your recipe says 10″ but that one looks like a 14″… so I guess either one will work, right? HAHAHAHAHAHAHAHAHAHA!!! Good one Alisha (or Dave.. whoever wrote that last comment)! I dont know what you are talking about. I did not cook for her on our first date… I made her watch an R rated movie on the 1st date! My cooking was not till a month or so in… And I cooked well that day! Whatever! I think you meant to say “Erica cooked well that day”. I think you did a good job setting the table maybe.. oh wait.. I did that too. I would love it if you posted more dutch oven recipes!!!! Thanks for all your hard work! I (Erica) actually usually do it over hot coals! Just do exactly as the recipe says– just over coals. I haven’t tried it in a crock pot but I am sure it would be ok. My favorite way is to do it over coals (as pictured).. just heat up the coals until they turn gray. It should be hot enough to put the bacon in right then and there. Then just continue the recipe — just keep checking the potatoes every 10 min or so until they are done to your liking. So there’s just 3 of us camping. I don’t want leftovers if I can help it so I was wondering about making half this recipe in a cast iron skillet with a lid. Any thoughts on whether you think that might work? I think that should work great! Have fun camping!